It’s not often that a highly-protectionist regime disappears leaving vast opportunities for air travel growth, but that’s what we’re seeing in Argentina right now. That’s good news is many ways, but it’s also going to cause a whole bunch of headaches from a logistical perspective. Get ready for a flood of new service. I hope this goes well. Until it ended in 2015, Argentina spent more than a decade under the Kirchner regime. First it was Néstor Kirchner for four years followed by his wife Cristina Fernández de Kirchner for eight. They were populists, and they viewed Aerolineas Argentinas as THE domestic airline, an arm of the government. Aerolineas Argentinas had an aging fleet and was shockingly inefficient yet it had near dominance over the country’s domestic market. While LATAM was able to mount some semblance of a competitive effort, it wasn’t without having to overcome all kinds of massive stumbling blocks. Those shenanigans even earned the entire country a Cranky Jackass Award. Flybondi is a low cost carrier that says it hopes to have 4 aircraft operating by the end of the year. It has big plans with 28 airplanes and dozens of destinations operating by 2021. Avianca Argentina is only tangentially-related to Avianca itself and is based on the ashes of Macair Jet. The airline plans to fly ATR turboprops on secondary routes. Norwegian, yes, Norwegian has no place to put all of its airplanes in the winter. So… Argentina! It sounds insane, and it is. But the airline is moving ahead with a plan to run a domestic operation from bases in Buenos Aires and Cordoba as well as long haul over to Europe from Buenos Aires. There are others too, but until we actually see some money and some airplanes, it’s hard to know who will actually get this off the ground in a sustainable way. Now here’s the thing. With the exception of piddly little Avianca Argentina (for now), everyone is gunning for Buenos Aires. It’s the capital, the economic center, and its metro area has about 30 percent of the entire country’s population. And Buenos Aires is a mess when it comes to airport infrastructure. The main international airport is Ezeiza, southwest of town. It’s where all long-haul flying happens along with most shorter-haul international flying. But it still plays second fiddle to Aeroparque which sits right on the water and is close to the city center. Aeroparque is hemmed in by the city and is pretty much built out. It used to be domestic-only but in recent years it has opened up to regional international destinations. This is going to change, however, because well, they need more room. In the next couple of years, the government is going to force all international flying away from Aeroparque with the exception of Uruguay flights. (Uruguay is so close they kind of consider it domestic-ish.) This is meant to free up space for new entrants to come in and wreak havoc. For those math whizzes who counted to three when looking for airports on the map and not two, good work. That third one is El Palomar. The old military base is opening up to commercial traffic. And Flybondi is very interested. In fact, it’s going to build its own terminal there if it gets its way. The split domestic/international airport is terrible for people who live in Argentina but outside Buenos Aires. It means that connecting options are much more scarce to the outside world than they otherwise would be. But there could be much greater utility if low cost carriers come in and bring lower fares to domestic routes. There is pent-up demand in Argentina, but there’s a lot of regulatory baggage that has prevented it from being realized. With a new government, the engine is there to finally provide Argentina with a half-decent air transport system. But the infrastructure is going to have to catch up. Let’s hope that happens before the passengers start arriving in droves. Think of Aeroparque Newbery as Buenos Aires’ version of LGA, with the additional fact that Newbery is close to some fairly nice neighborhoods. Ezeiza is Buenos Aires’ JFK, in that it has most internationally flights, is very far out from the city center, and is a pain to get to and from. The tourist/coast parts of Uruguay can be considered Eastern Long Island / Newport RI / etc. Uruguay has its own economy, but is still heavily influenced by money and visitors from Buenos Aires. There are regular ferries (high speed and normal speed) from Buenos Aires to Uruguay, so the flights from Aeroparque Newbery to Uruguay are primarily competing against ferries. There is (or at least was recently) price regulation in Argentina on a massive scale. Fuel prices were heavily regulated. Food prices were also regulated, but sometimes ignored with the government getting mad at those who dared to defy it. In my opinion Argentina could be a bigger tourist destination for those in the USA and UK. Jet lag heading to/from the USA/UK is minimal, and flight times and distances are similar to trans-Atlantic flights. A better analogy is DCA/IAD. Analogy also works better since both BA and DC and the respective capitals. Buenos Aires is also the largest city in Argentina, though, by far. Fair point, though, and I mostly agree with you. In terms of a small and convenient airport being located near the city center and near a lot of wealthy NIMBYs who would prefer not to be on the flight paths, vs a much larger airport located farther away, the DCA/IAD analogy is probably a better one. Argentina is a beautiful country and is worth visiting IMO. Patagonia in the south which is beautiful. Buenos Aires is a very cosmopolitan city with great food, especially beef. Iguazu Falls is very impressive. That’s what I saw in a 2 week vacation. There is Tierra del Fuego, Mendoza wine country, and some other great sights. When I went in 2014, the currency exchange rate was regulated. You got more for your dollar exchanging on the black market. That was an experience. I agree with your LGA/JFK analogy. AEP has only a one short runway and it felt like the gates were at full capacity. EZE is a large, sprawling airport and it was an easy airport to transit through, but it is a long ride into the center of BA. And this is why I read your blog! 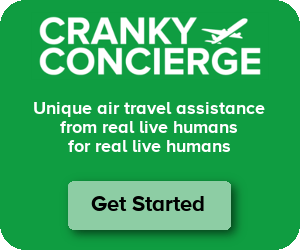 Very interesting – Thanks Cranky! Brings back memories, rode on a Southern Winds 737-200 from Aeroparque to Iguazu Falls and back several years ago after taking a Delta flight to EZE from Atlanta. Think Southern Winds has since gone away, was an enjoyable 2 hour flight, good service and friendly crew. I took the bus roundtrip to Iguazu Falls, twice, and even talked my 50-year-old mother into going along with me the second time. Good times- hot food, angled lie-flat seats, and even wine and liquor one on bus line. Not a ton to do at Iguazu Falls, but well worth hitting it during a full moon if they are still offering the special full moon night time tours. Great trip for a long weekend from Buenos Aires. I was in Argentina in 2014 and I can say that AR is the worst airline I’ve ever flown. I flew AEP – FTE and AEP – IGR as two separate round trips since I didn’t trust being able to connect on that airline. Boarding was more chaotic than in the USA. The baggage fees I had to pay for being overweight were random. It was 0 both times leaving AEP, $6 at FTE, and $25 at IGR. The cabin service was even ruder than the worst service I’ve ever seen in the USA. I was really happy to be flying Delta again on the way home. Plus, the inflight magazine was a piece of propaganda stating how government ownership was good for Argentina. So, I agree that competition would be a good thing for Argentina. Don’t even get me started on the Argentine government. You could smuggle a herd of llamas past the sleeping Customs agents in EZE and I doubt anyone would care, especially if you were white (huge discrimination against Indian-looking people and those from Bolivia, Peru, and Paraguay in Argentina), yet Customs & Immigration harasses car drivers and bus travelers on buses that are 30+ miles from the border. In my limited experience, if you want reasonably effective law enforcement (read: tough to bribe) and thorough Customs / Immigration agents south of the Rio Grande, Chile is your best bet. On another note, in 2007 or 2007 I flew Lloyd Aereo Boliviano from LPB (La Paz) to EZE, with a stop in Santa Cruz, Bolivia. I had low expectations, but the service on LAB was decent, the airports in Bolivia gorgeous, and overall the experience was actually a little better than what I typically got on US flights (total one-way mileage was around 1,560 statute miles). Flying out of LPB should be on every avgeek’s bucket list. From the insanely long takeoff roll (the airport is > 13,000 feet above sea level) to seeing the city of La Paz in the valley beneath the airport (the airport is called named “El Alto”, roughly “the height” or “the high plateau” for a reason), it was great. How is this Norwegian thing going to work? Are they going to hire local crews to work their flights for the months that they operate the network (if it is seasonal), or are they relocating existing crews temporarily? Oliver – No, it’s not seasonal. Sorry I didn’t make that clear. My assumption is that they’ll flex up more in the southern summer but it’ll be year round service. I don’t know how they’ll handle staffing or anything like that, though presumably they’ll hire locally for at least some. It’s a long post, but I would like to share my personal experience with AR in details, since it’s vastly different from the perception most people have. Before coming to Argentina basically everyone was telling me how awful AR was and that I should expect nightmare flying with them. Apparently my experience was very positive. I had a 2 weeks long trip to Argentina in November 2016 which included quite intensive travels around the country. I didn’t take a bus once (it’s very common means of transport in the country), almost all my travels were covered by AR and once I took a flight with LAN. So AR domestic experience was constantly positive – everything is simple, on-time and orderly. The only drawback was catering (and then leaving from EZE for ATL I had access to the AR flagship international lounge, again it was fairly nice, spacious and not crowded, but food was plain awful). The passengers were always mix of tourists and locals with a large proportion of business oriented travellers. I haven’t experienced zoo even once, neither at boarding or check in, or security checks. In general I now have very positive impression about domestic air travel in Argentina (except prices). Much better than Brazil. What impressed me a lot – airport infrastructure. All the airports except UAQ (which is truly terrible) were small, but modern with jet bridges and necessary facilities. Before coming I had the similar opinion – OMG how terrible they have EZE and AEP so far away. Yes, it’s not convenient for connecting pax but it’s fantastic for those heading to/from Buenos Aires, so it’s fair trade off. I absolutely loved AEP – modern nice and airy terminal, 10-15 min drive by taxi from the best parts of the city. Ezeiza is far, 30-60 min by taxi depending on the traffic (it took 60 min in the most terrible traffic around 6-7 pm weekday, so shouldn’t get worse than that), but the terminal itself is new and very nice. After travel in Brazil I expected something terrible, but apparently nope, everything was a level above and pretty good – in Buenos Aires and regional airports as well. Norwegian would be a nice addition of course. It would help to bring the prices down. However if they are going to see 100% increase in pax numbers I believe they should start investing in airport infrastructure. As I said, regional airports are modern and nice, but they are also very small (often just 2-3 jet bridges). Fly Bondi looks to be the one that will make all this come true before the end of the year. Also Sky airline is already doing some low cost flights between Chile and come Argentine cities. Looking good Aerolineas Argentinas will have to adapt maybe not go on strike so often. People have had it with being hostages of an airline and their attitude. I’m half Argentinian and will be flying to Buenos Aires next year for a wedding. I have relatives who work for Aerolinas Argentina – for many years highly bureaucratic and inefficient, they tell me. I will probably end up flying on AA through MIA. Agree on BA and the rest of the country. BA is very cosmopolitan – it’s a cliche, but it’s like the Paris of South America.